Biologist Father Ramon Ruiz-Sanchez is a part of a mission to determine whether the seemingly Edenic planet Lithia should be colonised and exploited. Whilst he is fascinated by the planet as a biologist, the 'transinfinite coincidence' (p. 76) of the existence of Lithia's sinless, anthropomorphised lizards appears to demonstrate to the priest that 'ethics can exist without evil alternatives', 'morals can exist without conscience', and 'goodness can exist without God' (p. 82), thereby undermining the fundamental precepts of his Catholicism and leading him to formulate the heretical Manicheanism that 'henceforth there is to be no more God, but only phenomenology' (p. 83). The exploration team return to Earth with a gift from the Lithians of an embryonic member of their own species. Egtervechi develops from a tadpole to a young adult in little more time than it takes to complete the voyage, is naturalised as a citizen, and quickly rises to a position of cultural preeminence by means of a television program that he hosts. In his mental and emotional displacement from his own people, Egtervechi comes to articulate the alienation at the heart of the culture delineated in A Case Of Conscience. Blish posits that the contemporary arms race that he composed this work in the middle of would evolve into a 'Shelter' race, with nation states building vast bunker cities underground and abandoning surface living. A 'preacher without a creed, an intellect without a culture, a seeker without a goal', appealing 'to all those who feel cut off, emotionally and intellectually' (p. 154), Egtervechi is something of a cross between Milton's Lucifer and the Edenic 'Snake' (p. 149 et al), and the dissent that he engenders within Shelter society finds its final expression in a series of riots that threaten to destroy it as 'the beast Chaos roar[s] on' (p. 170). 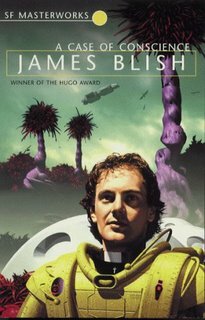 A worthy entry in the SF Masterworks series as winner of the 1959 Hugo Award, A Case Of Conscience supports the assertion that James Blish's canon stands as a bridge between 'Golden Age' SF and the contemporary genre. In developing its theologically allusive, intellectually provoking argument, Blish (a life-long atheist) demonstrates that whilst fideism may innoculate the believer against certain delusions, the chimerical basis of religion ultimately dulls perspicacity to a point where the obvious becomes obscured by the seemingly pre-ordained. Hence whilst the reader may understand the destruction of Lithia at the end of the work to be the consequence of the disastrous failure of a high-energy experiment, Ruiz-Sanchez's faith perceives it to be the inevitable outcome of a planetary exorcism. 'That is what evil does - it empties you'.